IS THIS THE FACE OF ROBESPIERRE??? 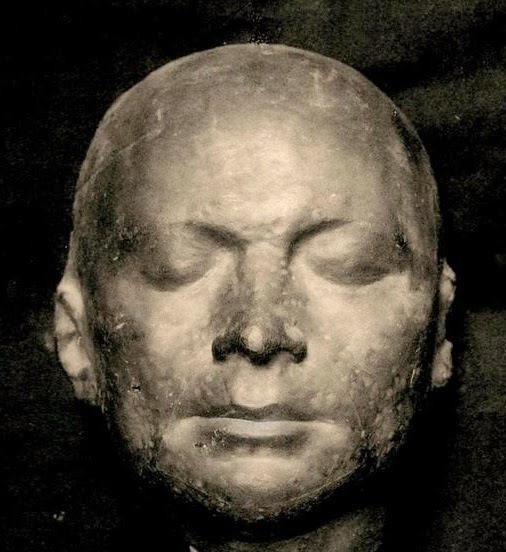 As you might gather, I have finally found a copy of Hector Fleischmann's work on the death masks of Robespierre and so have a little more information to add to my previous posts. A large part of Fleischmann's account is taken up with the 1911 fake head, but he adds details of some other masks - all today sadly lost or in private hands. 1. A plaster cast belonging to Vivant Denon. 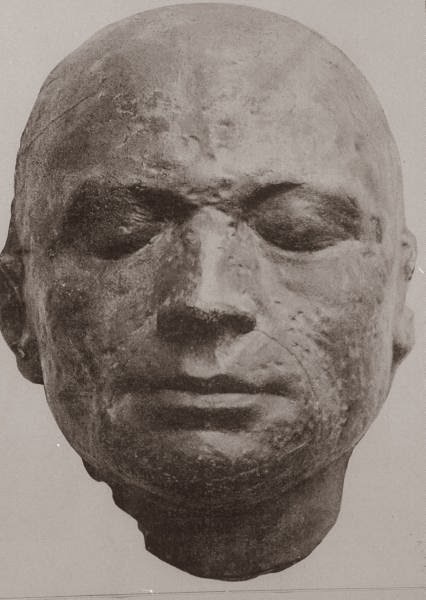 No.652 - Plaster - Cast moulded from the face of Robespierre, before his death. Height 9 and a half inches (ie."pouces"). The mask was sold on 26th May 1826 and has not been seen since. "This copy was taken from the original mould which was cast on the face of Robespierre, immediately after he was guillotined, and which belonged to citizen Turbri, composer of music". The "citizen Turbri" in question may reasonably be identified as the musician François-Louis-Hébert Turbri (1795-1859) but why or how he came by a death mask of Robespierre remains a mystery. Possibly he had bought Denon's cast in 1826. At this point just how many masks are involved becomes a little confused. Fleischmann mentions one mask belonging to Léon Moreaux and another exhibited in 1889 in the Paris Exposition historique de la Révolution française. According to Buffenoir's Portraits de Robespierre, these two were one and the same. It was also this mask which was reproduced in a catalogue of Revolutionary memorabilia (undated) by Armand Dayot. UnfortunateIy I can't find an accessible copy of this work and M. Dayot, an ardent robespierriste, refused to divulge his sources to Fleischmann. Fleischmann identifies this as separate example. Gabriel Thomas was an investor who,significantly enough, having previously been involved in the companies running the Eiffel Tower and Théâtre des Champs Elysées, in 1883 gave substantial financial backing to the Musée Grévin. The picture in the Picpus Digital Archive reproduced at the top of this post is identified as a mask "belonging to Gabriel Thomas". A photograph of the same mask (with the same marks on the scalp) is reproduced in John Laurence Carr's 1973 biography of Robespierre, where it is labelled as coming from the Radio Times Hulton Collection, and it is also in the LIFE online photo archive. As already noted, it looks very impressive. You can even see the small wrinkles in the skin of the eyelids where Robespierre (no doubt very much alive) had shut his eyes. The pockmarks which have caused such controversy in the recent facial reconstruction are also clearly in evidence. It seems that additional information just raises additional questions? . How many masks were there? The photos seem to depict two different examples but it is difficult to be certain. Are either of them the mask that belonged to Vivant Denon? Where does the composer Turbri fit in? Do they represent a different death (or life) mask from that in Madame Tussaud's? Above all where are they now??? Robespierre has been shot in the jaw the night he was arrested. he had no grave so that nobody could honnor his memory, so 2 questions. Why would have they mold his face if the excutors did'nt want anyone to remenber him? how did they mould it with a perfect jaw? and a bit funny how a mortuary mask can be donne before death? The Church of St Geneviève .... or not?